What do you think of when you see a windmill? I think of the pioneers who settled on the prairie where there was nothing but grass--no trees to break the wind and no ponds to water their animals, family or crops. 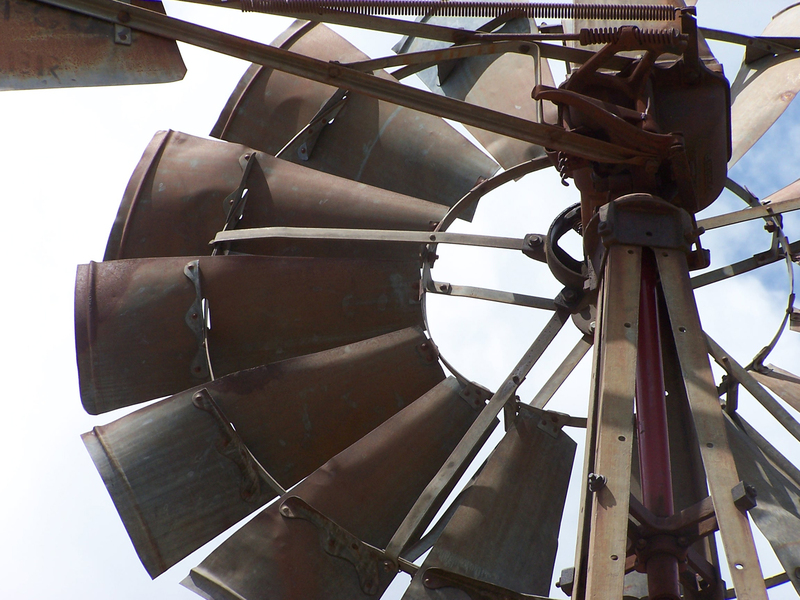 They built windmills to harness the ever-present wind on the Kansas prairie and pump water for their needs. Windmill repair was once a common skill--if you couldn't "pull a well" and "fix the mill" you might wait a long time to find a neighbor who could help you out. Tools and equipment were designed to make the job easier and safer, and every farmer had a set of those tools. I did not grow up using windmills in our Kansas pastureland. We watered our cows from ponds and creeks and sometimes a spring or two. We built tanks to collect spring water, maintained ponds with fish and plant life to keep water fresh, and had a creek or two that filled natural tanks for cattle to drink. The first summer after we were married, my husband and I needed to repair one of the few windmills in his family's pasture. He amazed me with his skill and knowledge of how a windmill worked and the ability to figure out the tools! They were all foreign to me and I had no idea of the danger of pulling a well without these tools. He told me he learned it from his dad and from neighbors who were willing to help and teach. Today, it is more common to see an electrical pole run to a submersible pump in a well, or even a solar pump connected to the well in a pasture. The windmill pictured above pumped water for cattle for many years before the fan head was mangled in a 100-mile an hour windstorm in August 2009. Today it is difficult to find parts to fix these ancient mills, and if you can find a part, it may cost more than the entire windmill is worth. So many of the old mills are rusting and decaying--falling apart where they stand. This one is in our pasture, on the top of a hill near a county road where people drive by every day--never even thinking about the heritage of the windmill. There are people who still use their windmills and still need the ability to pump water at a location that electricity cannot reach, but more and more people can't afford to pay someone to fix an old mill, and don't have the knowledge, time or tools to fix it themselves. A part of me is saddened by that, but another part of me realizes that things change--technology advancements and changing needs have created a new era. Gone is the day when ranchers could spend a full day on a windmill repair. There is so much other work to be done and so little time to do it in. We'll keep our working windmills around as long as we can.